I love a good pamper and my go to is a face mask in a bubble bath. I have used and loved the Montagne Jeunesse face masks for as long as I can remember. They have such a wide range to choose from and they are so inexpensive. To celebrate their 30th anniversary they have had a bit of a face lift and rebranded as 7th Heaven, the name was chosen by their lovely customers. I personally love the name and I can finally pronounce it - yay! Each of the face masks I am going to be talking about are just £1 each which is such a bargain for how good they are. 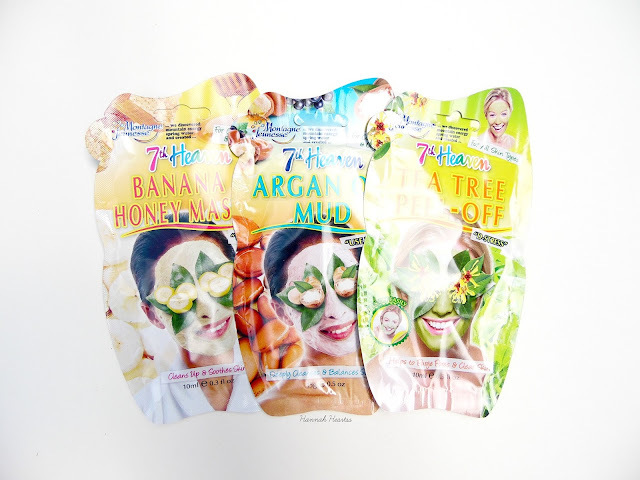 The Tea Tree Peel-Off Mask* for suitable for all skin types and helps to purge pores and clear skin. Having never tried a peel off mask I was so excited to give it a try and I loved it. You apply it the same as you would any other face mask and once you have left it on for 20-25 minutes you peel it off. I was having some terrible break outs so I thought this would be perfect to try out first. It really helped calm down my skin and reduced a lot of the redness I had. I did notice in the hours after using this that a couple of my bigger spots had gone down. When it came to peeling it off it was really easy and simple. It peeled off in a couple of tries and none was left behind. As I previously mentioned, my skins been terrible at the moment so the Argan Oil Mud Mask* couldn't have been used at a better time. This mask is suitable for combination and oily skin and aims to deeply cleanse and balance skin. Once applied I left it on for the recommended 10-15 minutes and let it work its magic. This has to be one of the best face masks I have tried. As soon as I removed the mask my skin was brighter, softer and the redness was reduced. The next morning after using this my skin was so much clearer and many of my posts had disappeared. I wish I used this mask sooner because my skin would have gone back to normal much quicker. Finally we have the Banana and Honey Masque*. This mask is suitable for combination and dry skin and aims to clean up and soothe skin. I must admit I am not the biggest fan of bananas or honey so I wasn't sure if I was going to like the scent or not but I actually quite enjoyed it. I popped this onto my face and left it for the 10-15 minutes which it is recommend for and once removed my skin was so much calmer looking and any redness I had before hand had completely disappeared. I noticed the next morning that my skin was looking so much brighter and this was the only thing I had changed - love this one! Each of these face masks are available in Boots, ASDA and on the Montagne Jeunesse website for £1 each.